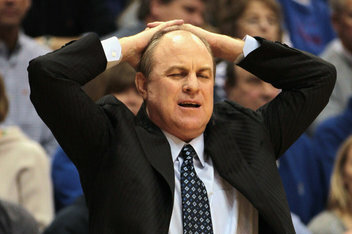 I love the Steve Alford hire. I’m watching the Kevin Ware injury on repeat. I have little interest in what Aaron Gordon has to say tomorrow. It was about time to get the Oregon cheerleaders off TV. I will not miss this college basketball season. But I really want to dig into this Alford hire. It came across my ESPN ScoreCenter push notifications at something like 8:50am Saturday on my way to a pickup hoops game. I was driving alone and immediately didn’t know what to do. I headed to social media, quickly, and then to Wikipedia. The Alford page already mentioned UCLA. Hadn’t he just signed a 10-year deal in Albuquerque? But I’m willing to give the benefit of the doubt here. He’s signed, sealed, and delivered and it’s going to be his show. BruinsNation must withhold their vitriol for a minimum three-seasons. In my opinion, at least. The Howland firing was universally accepted as a necessary change. It doesn’t always look right on paper but a break was necessary. A lot like your college girlfriend. Alford doesn’t fit all the buzz words like “winning the press conference” or “home run hire” but he does offer a new regime in Westwood which is what the Bruins had coming to them. And while some will tell you that he was hired in desperation, that Shaka Smart and Brad Stevens’ declining led Guerrero to jump on the first available “yes”, I’m not buying it. Who’s to say he hadn’t been in the Pitino and Donovan camps for weeks? Why wouldn’t he have been? You fire the Head Coach of the conference champ and you knew you were going to do this for awhile. Phone calls were made. Interests were felt out. Guerrero had at least an idea of which trees to bark up and at a certain juncture he barked up the Alford tree and here we are. Whether he’s a good fit or a successful hire will ultimately boil down to how he fills the left column. History suggests he might struggle to do so. I say give it time. This hire can can hold the promise of spring after a cold winter. And it sure ain’t April Fools. Honestly my first reaction was sadness. I did not enjoy seeing Ben Howland and the program he led and the manner in which he led it so widely chastised and considered ruinous. And I understand the nature of this beast. It’s a business of immediate criticisms with many anonymous critics free to spout whatever they wish from behind the security of a screen name. Also a lot of very public critics. But I suppose what I find so interesting about this now vitriolic UCLA fan base – now encouraging their former coach to not let the door hit him on the way out – has been their insistence on replacing “Coach.” To ensure that there is a head figure to carry forth the program of Coach, with the principles of the pyramid bound to their mind and inscribed across his heart. Ben Howland is a helluva basketball coach. Somewhere along the line he lost his way as the elite guy he swiftly proved himself to be; but, as evident by this season’s Pac-12 championship, he didn’t stray too far from what exactly he is: a terrific basketball coach.As it unfortunately were, he did not have the energy to carry the torch of the past; to embody the man (Wooden) whom he is not, was not, and will not be. An exhausting task to compete with the ghosts of the past. But as I said, there is a beast to this industry and so, when expectations realistic or otherwise are not met, the beast rears its ugly head and axes are swung. I’m not trying to make an argument here for keeping Ben Howland. It’s become clear that he is not the right man, right now, to be the lead at UCLA. His time had run its course. There was little enthusiasm in Westwood and Howland seemed to be doing very little to instill excitement in the program surrounding his on-court product. It would appear that both parties are best suited with a fresh start. Which might be exactly what the UCLA program needs: A fresh start. And I’m not talking about simply a new coach. John Wooden will never be replaced. He can and should be respected and remembered are revered but no man will be successful in any venture mimicking another. The Bruins are about to acquire a very good coach. A man with an impressive resume and the utmost respect for the job he’s inheriting. But for him to be successful, for him to truly uphold the principles of “Coach’s Program,” he will have to be his own man. Whatever that is, he will adhere to his own principles and succeed by his own strengths. He will win because, in his own right, is good. Ben Howland will take a season or so off and find his way into a new position somewhere and likely be very successful there. He’ll find little appreciation for his ten seasons in Westwood (the longest tenure since Wooden) but he should sleep well at night knowing he’s good at what he does: Coach basketball. May his next venture allow him to do such. May UCLA’s next venture allow someone to succeed. Read it, don’t weep, at ryanrecker.com, along with a bevy of podcast goodies. This is the finale. The last Weekend Preview we’ll read, the end of the regular season, the close of a forgettable year. But you know what? The Madness is here and this is why – no matter how bad the early losses to South Dakota State, Loyola Marymount, Wyoming, or Seattle-Pacific sting – we kept watching. For the shots that fall a blink before zero and the names that are called on Sunday afternoon and for that mad Thursday and Friday where a two-hour lunch break is gone in a flash. To rationalize our favorite 12-seed winning it all and to become irrationally lost in a close game and to lose your five bucks in the office pool to Diane in HR who just thought Shaka Smart was cute. For one shining moment. Yes, this is the greatest of the twelve months for all of those reasons and more. Get excited. Get rowdy. Get some time off work. TV Complaint: Seventy-five percent of Thursday’s games will not be televised. This is undoubtedly a complainable offense but let’s re-frame it. Life’s better if we can twist things into something a little more bright so I will remind you – as Thursday’s sole televised game is a mega-matchup – that this evening’s broadcast shorcomings will be the last. Indeed this final weekend is the final weekend of regular season Pac-12 basketball (or football or baseball or water polo or gymnastics or underwater basket weaving) that we will ever endure sans the Pac-12 Network. Take a moment to turn this on and celebrate for a moment. No doubt you’ve followed the commentary but I’ll remind you that Larry Scott will be putting every regular season basketball and football game on television. No more hacking networks, radio pirating, or twitter fiending. Your games shall be yours. Rejoice. Game of the Weekend: No buildup here. Colorado heads to Oregon to play, straight up, for a spot in the top four. We won’t discredit Saturday’s games when the Buffs travel to Corvallis and Ducks host the Utes, but Thursday’s game has major post-season ramifications. Should the Buffs win – their first major road win of the season in the final weekend – they’ll secure themselves the four seed (of course assuming the road sweep which is no easy task) as they would drop the tie-breaker to Arizona. If Dana’s Ducks win, they’ll wind up the three seed as they hold the tie-breaker over the Wildcats. But enough about standings, hypotheticals, and making asses out of ourselves, this is going to be a good one. We’ve outlined what’s at stake so now recall that Boyle’s Boys previously beat the Ducks on a “controversial” foul in the final seconds, sending Oregon home bitter. The rematch is on a bigger stage, with tangible outcomes and is the first big game in March. Doesn’t get any better than this. Game to Avoid: Every game that doesn’t have top-four implications. Sorry, but if you don’t have a chance to dance then the season’s over. By all means I expect the teams to maintain their competitive spirit and try their best; channel their inner non-Bruin and show up. But that doesn’t mean you have to. Your time is precious and act accordingly. The current TV deal’s swan song will make most of this easy for you but don’t bother logging on to usctrojans.com to take in the USC-WSU game. Ignore the UCLA-WSU or Utah-OSU games, too. Beyond that avoidable triumvirate, every other game has Pac-12 (or bigger) tournament seeding ramifications. Down to the wire. Something to Prove: A strong showing this weekend could put the Oregon Ducks in the Big Dance. Beating Colorado tonight will nearly guarantee them the third seed and a first round bye. But here’s the deal. Oregon has the second highest RPI (48 vs. Cal’s 37) and dances in six different bracket projections. I won’t spell out their tournament resume but know that these guys are intriguing and dangerous with an impending conference tournament to play. A tournament that could prove deal making – even without running the table – for the Ducks. But don’t mistake intrigue and opportunity for the red carpet. Sweeping the visiting Ski Trippers and making a run through staples is imperative and difficult. It’s a fragile destiny but one that Dana and his Ducks could control. Of course we need to hat tip here to the Buffs as they too have an equal shot to make some noise. If nothing else, Boyle and company can aggressively plant the CU flag on Pac-12 Mountain. Something to Lose: Once the darlings of the downtrodden conference, California is coming off a semi-surprising loss to Colorado, sits alone in second place and should they lose on Sunday to Stanford – a place they’re 1-3 the last four years – Monty’s Crew could find their way to fourth place (I cannot fully substantiate that claim without extensive tie-breaker research but it’s semi-feasible and highly dramatic). It’s no time to panic in Berkeley but things have undoubtedly been brighter especially considering its felt as if the Bears controlled their destiny much of this season. I really can’t see Cal playing their way out of the Big Dance but the Bears could stand to piece together a nice little closing run. If for no other reason than their own sanity. But despite the current onslaught of one-bid league talk and point-and-giggles, it is what it is and your team’s got a shot so long as they’re not a Ute, Trojan, or Sun Devil. And ultimately, having a shot is what it’s all about. Also bear in mind that Tim Tebow never beat a Pac-12 school (irrelevant that he never played one). Leader in the Clubhouse: Colorado, duh. The Buffs sit atop the conference standings as the only undefeated team. Of course they’re also the only team that has yet to play a road game but that shouldn’t take anything away from Tad Boyle’s group. Few people want to or will hop on this band wagon, but it is worth noting that Colorado has won their three conference games by an average margin of 23 points. They may not be the favorite but the Ski Trip cannot be taken lightly anymore. Game of the Weekend: Well this one’s easy. Stanford and Oregon State’s quadruple overtime thriller takes the cake. Watch some exciting stuff here. This was a grossly painful loss for the Beavers who’d kicked their weekend off right with a solid win over Cal and a shot at making it a brutal weekend for the Bay Area schools as Stanford had lost on Thursday. Alas, it wasn’t in the cards (pun!) and Craig Robinson finds himself in an unfortunately familiar position at the bottom of the Pac. But 11th place is new so that’s kinda cool? The Big Loser: The Washington Huskies took the Pac-12’s innagural ski trip to swiftly demonstrate to everyone just how disappointing they are. After an exciting sweep of the Oregon schools and a moderate return to the hype machine, Lorenzo’s team caught an edge (ski reference!) and face planted in front of the hot ski instructor on work exchange from Switzerland. And now I’ll return to the afore-used “disappointed.” I want more from this Huskie team. I’ve been a bit down on them for awhile and Romars roller coaster season’s have been frustrating to watch during these down years of Pac hoops. The talent has been there and it comes as no surprise to me that his teams have played well in tournaments (back-to-back Pac-10 tournament titles and a Sweet Sixteen). I therefore wouldn’t be shocked, in the least, to see this team playing its best ball when their back is against the wall. It’s just too bad that’s what it may take. What We Learned: I think I’ve been saying it for a bit in some capacity but let’s make it traceable: an 8-1 home record and 5-4 road record will win this conference. That’s 13-5, you’d have beaten every team at least once, and hopefully swept Utah, USC, and ASU. A loss to any of those three schools very well could be the kiss of death but my overarching point is teams must follow the current pattern and win at home. The home team is 14-6 thus far with Utah and USC accounting for three of those losses (ASU has yet to play at home which is probably OK because no one is going to attend anyway: 4805 average attendance). I saw someone dropped the stat that there were only four BCS schools with losing records at this point in the season. Our aforementioned cellar dwellers accounted for 75% of that foursome. Look, it’s going to be a long season for any and all of the Pac-12 schools but that doesn’t mean there isn’t an intriguing aspect to the whole thing. The beauty of college basketball is that you can play your way into that mad little event in March and then anything can happen. Just ask Shaka Smart or Bill Self. Or Tim Tebow.